*Coach Dianna “Miss D” Williams, had a major presence with her “Bring It” majorettes on the red carpet at the 20th Annual Essence Festival. Based in Jackson, Mississippi, the Dancing Dolls troupe made up mostly of young girls age ten to seventeen, has won over fifteen Grand Championship titles and more than one hundred trophies. EURweb’s Lee Bailey caught up Williams and her young dancers to talk about their Lifetime competition series and how they keep in step! 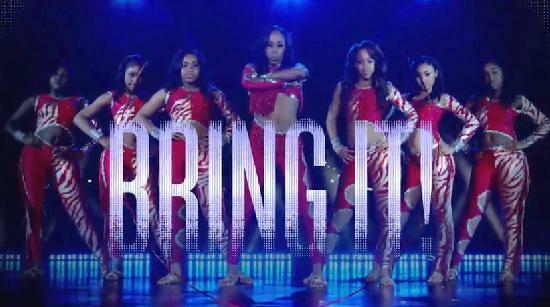 “Bring It” airs on Wednesdays at 9/8c on Lifetime. For MORE, including latest episodes,go HERE. I love this show….and the girls and the mamas and Miss Dianna. I used to say this reality show was my “guilty pleasure” but it’s actually a pretty cool, watchable reality show with a lot of redeeming value. Many of the girls are quite talented with lots of personality and drive. Plus the life lessons that Miss D pushes are invaluable as these young women face the tough world of competitive dance as well as the world in general. Keep up the great work girls! I love this show. Keep the good work up Miss Dianna. The dancing Dolls are the Best.